Many of us, when we think of volcanism, think of volcanoes such as we see here on Earth. Hawaii and Mount St Helen’s come to mind, or - if you know your history – perhaps Vesuvius, Santorini and Krakatoa. Whatever, people tend to think of mountainous edifices that belch hot lavas out of the hole at the top of the mountain. Well, we amateur astronomers know better than that ! You’ll recall from my presentations on the Rocky Planets that Venus was totally resurfaced by volcanic activity at sometime during the past 1 billion years, yet volcanic mountains are relatively few and far between. 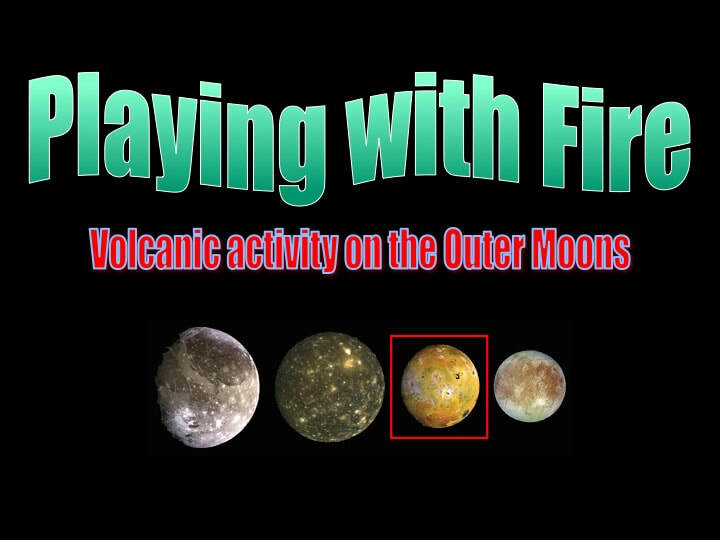 From your own observations, you know that despite the presence of the lunar Mare, which are huge lava basins, the Moon does not have an over-abundance of volcanoes. Mars does indeed have a few major volcanoes, but they do not account for the ancient basaltic lava that covers most of the planet’s surface. So the lesson from the Rocky Planets is that (i) volcanism in the Solar System can take on many forms, (ii) not all volcanism is associated with volcanoes, and (iii) not all mountains are volcanic. So with this in mind, let’s take a look at the most volcanically active body in the entire Solar System – Jupiter’s Moon Io. One look at these two faces of Io is enough to tell you that the surface of this moon is very young and very active. ​For those who prefer it, the same thing can be presented as a map. Let’s start with an Ionian mountain that I would have thought was a volcano, but apparently planetary geologists are not sure. Tohill is an isolated mountain located just south of the volcano Prometheus. It stands over 5 km high, and sure looks to me as though it has a major crater at the top. Whether or not Tohill itself is a volcano isn’t really very important – what’s important is that although Io is a highly active volcanic moon, most of its mountains are not volcanic in origin, and most of Io’s volcanoes do not form mountains. Consider a 3D image of Tohill that’s been stretched to emphasise the vertical dimension and emphasise the volcanic look to the mountain. It sure looks like a volcano with a crater to me. The important question here is, when they’re not volcanic, how do mountains form on Io ? Here’s Mongibello Mons -7 Km high - imaged when the Sun was very low to emphasise its three-dimensionality (as indicated by the shadows). This is interpreted as a tilted block of Io’s volcanic crust that was pushed up a tectonic fault : think of it as something that was pushed up a ramp. Here’s another example of a non-volcanic tectonic mountain on Io. You can see what looks like a rift valley running round the far side in the shadow of the mountain. This is also interpreted as a tilted block of crust, but this time the rift formed by crust sliding down the fault ramp, while the mountain block rotated in the opposite direction to compensate for the sliding. Compared with the mountain, the volcanoes in this image are pretty flat affairs. How do we know they're volcanoes ? Because the dark areas highlighted here turn out to be pools of hot lava ! So, let’s visit some real Ionian volcanoes and see what they look like. The large beast in the foreground has relatively low topographic relief, but I would still call it a volcanic edifice. You can see a major channel where lava ran from the volcanic summit down to the volcanic plains that dominate Io’s topography. But look at the "volcano" in the distance; it’s not just flat – it’s a hole! All that’s there is the lava pool. Consider an aerial shot looking down on a volcanic centre west of Pele (P) and south of Loki (L). I don’t mean the round structures : focus on the dark “hand-print”. Again, there’s very little topographic relief : it’s more like an asymmetrical lava field where the hot runny lava has flowed like fingers to one side of the volcanic centre located here. The chances are that if you were standing next to this “volcano” on Io’s surface, you probably wouldn’t even see it ! Consider the volcano Prometheus, plus a volcano actively erupting just over the horizon (I don’t know which one that is!). Prometheus is not small - note the scale bar - but it’s not exactly a mountain either. Again it’s more of a lava field, but a long linear lava field. We can see the pattern of lava flowing asymmetrically away from the volcanic centre. Consider these two ages of lava that flowed out of Prometheus. The older lavas (top-right) are now part of the lava plain that dominates the moon’s surface, and the younger lavas (bottom-left) flowed over them and covered the ridges that look like ripples on water. Visually this is an amazing image, but unfortunately no-one seems to have an explanation for the ridges in the older lava plain. ​Here are two more volcanic structures, each one 100 km in diameter. The first looks like a simple hole in the ground, but it’s actually a volcanic caldera which formed when the magma beneath the volcano escapes and the volcanic edifice falls into the hole that’s left . The problem in this example is that the magma usually escapes onto the surface as lava - but there’s not much sign of that having happened here, and no-one’s sure where the magma went ! To the right we see a large “Shield Volcano”, that actually looks like a classical “volcano” something along the lines of Hawaii. However, these Shield Volcanoes are rare on Io. Why ? The observed lack of Shield Volcanoes, plus the generally very low topographic relief of most of Io’s volcanic features, leads us to an inevitable conclusion: Io’s lava’s are just not viscous or sticky enough to build mountainous structures. Think of trying to pile up warm molasses ! The lavas must be too runny. Consider the wonderful image of the lava field just east of the volcano Emakong, located east of Prometheus. Again, the topographic relief of the volcanic caldera (that's the big grey lava pool to the left – note the scale bar - is pretty subdued. Now focus on the lava field to the east of the caldera, and you can see a long wiggly channel. It’s a lava channel, and it simply confirms that Ionian lavas are very runny. Consider Loki, one of the more celebrated Ionian volcanoes, located NW of Pele. Once again, we see how subdued the topographic relief is for this gigantic volcano (check the scale bar – 200 Km). The dark feature that dominates Loki is a giant lava pool. When this image was first seen, some planetary scientists interpreted the relatively smaller blocks light coloured blocks as “floaters” calved off the larger one – rather like icebergs calve from polar ice caps. These are now seen as islands of older, crystallized lava poking up through the lava pool from the lava pool floor. The most famous Ionian volcano is Pele, surrounded by its ring of red ash. The reason for the ring is the absence of a substantial atmosphere around the moon. This means that the erupted ash meets no frictional resistance, so the only thing that slows it down and pulls it back to the moon’s surface is gravity. The outcome of this is that the plume of ash has the shape of an umbrella and the erupted ash all falls at a certain radius from the volcanic centre. Here’s Pele in action; the volcano is just beyond the horizon so the ash plume looks complicated - this is a spectacular image ! Having toured a number of the major volcanic features on Io, how do we know they are made of once hot lava ? In addition, what do we mean by "hot" on a moon with no atmosphere - and therefore no insulation ? Consider Amirani, the largest lava field anywhere in the Solar System, located NE of Prometheus. ​Infra-red radiation is heat, and hot spots (in the bright colours) represent the most recent lavas. While there are clearly two very recent volcanic centres, we have to conclude that there are multiple warm volcanic centres all over the length of Amirani. The same thing can be applied to a volcanic caldera. Consider Tupan, a 50 Km lava pool with recent hot lava to the North and older, warm – most probably crystallised - lava to the South. Note that the steep cliff casting a shadow on the North side is a kilometre high ! Io's volcanism has even been caught in the act. Tvishtar volcano - way North of Prometheus – was caught erupting lava fountains in November of 1999. By February of the following year, 3-4 months later, the first eruption had ended and the site of eruption had moved. Again, note the scale bar. So, we do indeed know that Io erupts hot lava - and not some other mysterious substance - and it does so all over the moon, and is still doing so today. How hot is Io’s surface with all this volcanic activity going on ? Aside from the actively erupting lavas themselves which attain 1600° C, Io is actually pretty cold ! Infra-red images at the scale of the entire moon tell us that even standing right on top of a recently active volcano, the surface temperature is a chilly minus 100 C ! In short, Io is not a cousin of super-hot Venus because it has no atmosphere to provide thermal insulation. So what powers all this volcanic activity on Io ? Given its slightly elliptical orbit - and the systematic gravitational tugging it’s subjected to by both Jupiter and the other Jovian Moons – Io’s interior is flexed like a rubber ball. This flexing - referred to as “Tidal Flexing” – is the rock equivalent of tides raised on the Earth by gravitational interaction with the Moon and the Sun. All this flexing results in work which is converted to heat. Note that this is not due to friction. Frictional heat is what you get when you rub two sticks together, like a boy scout trying to make a camp fire. “Tidal Heating” is more like what happens when you rapidly bend a copper wire back and forth a few times and the bent copper heats up. ​In several of the presentations I've given in this mini-series, I've discussed examples of cryovolcanism, the eruption of water or slushy ice on moons such as Saturn’s Enceladus. The take-home message is that this ice volcanism – although it occurs at much lower temperatures than the volcanism on Io – still requires heat, and that heat is derived from the same source as on Io : “Tidal Heating”. “Volcanism” is a common phenomenon throughout the Solar System. However, it’s a very diverse phenomenon that we’re just beginning to understand : one that involves materials ranging from molten silicate rock to water ice mixed with ammonia. Io is simply the most spectacular example!